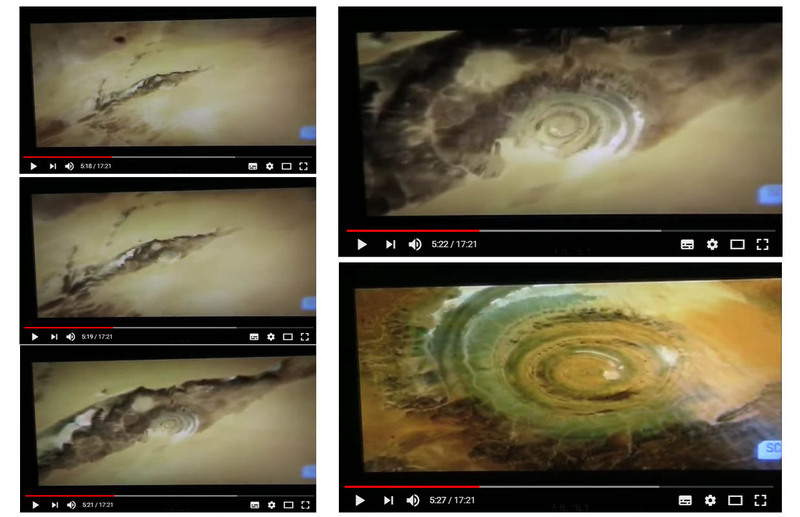 Electric Universe - EYE OF THE SAHARA - an electric discharge feature? Mars has a scar, a scar that runs one third of the way around its equator. It's called the Valles Marineris and it's a Grand Canyon-like structure with tightly scalloped edges may have been carved from the Martian surface by insanely brutal electric forces i.e. when Electric Worlds Collide'd, some time in the not-too-distant past. And by that I mean, "Not billions of years ago," but maybe hundreds of thousands of years ago, or more recently i.e. within recorded human history. Some strange lightshow in the sky an ancient human race might have recorded in cave art, whilst cowering from the electric storm. The image (above) shows a DISTURBINGLY SIMILAR tightly rock cut, or scalloped, electric-discharge resonant feature in the west of the Sahara Desert here on Earth. It's called the Eye of the Sahara and has features of both Mars' Valles Marineris and Olympus Mons, the big electric blister three times higher than Everest. Resonant ringed features often appear in electric discharge experiments in the lab. Perfectly preserved in the Sahara desert, surely it will contain features and minerals that support the Electric Universe concept of Large Stellar Bodies exchanging the so-called Thunderbolt of the Gods?